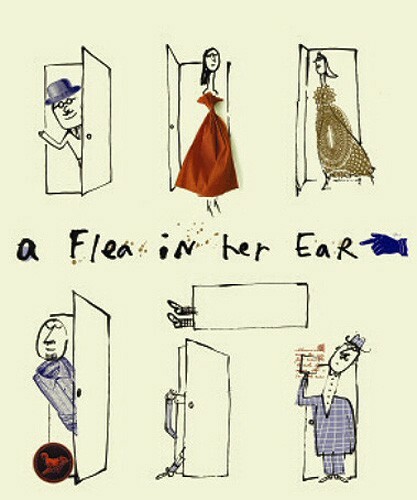 The Artwork for Williamstown Theatre Festival’s production of A Flea in Her Ear. 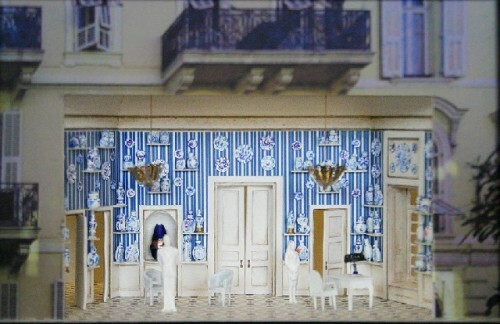 The Act I Set design for A Flea in Her Ear,by Alexander Dodge. 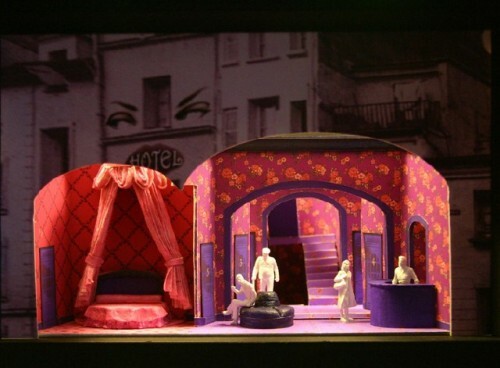 The Set Design for Act II of A Flea in Her Ear, designed by Alexander Dodge. 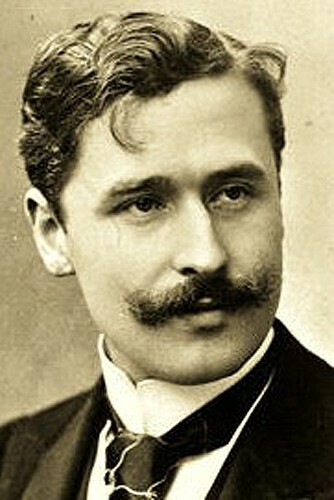 Georges Feydeau who wrote the classic French bedroom farce A Flea in Her Ear in 1907. Actor Mark Harelik says a manic farce like A Flea in Her Ear is not something you would want to try at home. It is very intricate, and doing pratfalls can produce serious injuries. "In rehearsal we have to go through it inch by inch, matching the words and movements with the slamming doors, the dozens of entrances and exits. But once it becomes familiar to everyone, it is like rolling a snowball down a mountain. There is no stopping it." Georges Feydeau, the French genius of comedy, that is. He wrote down the improbable situations, the endless details, like perfect recipes that still delight audiences more than a century later. Director John Rando says: "It is great fun following his schematics." However, the script he is following is not the same one you may have seen before, it is a new translation by British playwright, David Ives. "David is an old friend of mine, a close friend, and when I read this version he had done for Chicago Shakespeare, I just fell in love with it immediately," Rando, a Tony winner for Urinetown explained: "He has written a very funny version of the play, which is true to the original but with a great sense of language and wordplay that just makes it perfect for an American audience. I just knew I had to do it." "So I proposed it to Nicky (Nicholas Martin, Williamstown Artistic Director) back in January because this is the best of two worlds - both very refined and very funny. He agreed and put it on the schedule." It turns out that not only did Ives do the adaptation of the script, down to its finest details, but he translated the lengthy stage directions as well. Sometimes they are more extensive and precise than the dialog. "David went back to the original script and did the line by line work himself," notes Rando. The words by themselves are not as important as the improbable physical situations the characters find themselves in. As Feydeau famously said: "Whenever two of my characters absolutely, positively under any circumstances shouldn't meet, I put them in the same room together." Rando admires Ives and Feydeau equally: "David Ives is not only a great comic writer, but also a great master of absurdity and playful language that is not only fun to watch, but fun to act. This is the defining French farce, this is the play that burst Feydeau onto the scene. He had many plays, but this is his most extreme and hilarious play"
For the actors, all that running around is both exhausting and somewhat dangerous. "But at a certain point it does begin to run itself and smooth out," Mark remarked over the phone. "You can't see how drenched my shirt is from rehearsals which just ended a few minutes ago. I was priding myself on not being a sweater, but it appears I am a full cardigan." Ka-cha-boom. Still they are under pressure because of the short rehearsal time. It is essential that the frenetic chase scenes and sudden entrances and exits to be timed perfectly for everything to work on stage. Director Rando jokes, "People don't get to rehearse in the Berkshires, do they? We just all sort of arrive and the brilliance happens, right?" "But you can see if something does not get enough rehearsal time," he agreed, adding as an afterthought, "Are you a critic who is going to come gunning for us," Rando asks jokingly. "A critic, yes, but my associate Charles Giuliano will be doing the review in this case." I responded. "Then we hope that both of you will have a good time. This is a stellar cast we have, just consummate professionals who understand what it takes to arrive at a really fun pace in this play." In addition to Mark Harelik, the cast includes Brooks Ashmanskas, Mia Barron, Jeremy Beck, MacIntyre Dixon, Carson Elrod, Tom Hewitt, Tom McGowan, Kathryn Meisle, Geoffrey Murphy, Heidi Neidermeyer, David Pittu, Debra Jo Rupp and Sarah Turner. Rando was just warming up for the pitch. "I see the play as analogous to being in Paris and discovering this great pastry shop full of delightful treats in the window. You just want to go inside and buy the shop out. I think this is how the audience will experience this play. It skewers the bourgeois mentality of the time (1890's) and at the same time celebrates it." The Chicago Shakespeare Theatre production had a towering three story set which attracted much notice. So what kind of set will Williamstown play on, we wondered. According to Rando, there are two sets. For the first act, which is set in the home of Chandebise and her insurance company husband, it is a modest turn of the century Parisian apartment. The second act is at the hotel. "It's a simple hotel where the middle class goes to have their affairs. It is more cozy than ritzy," Rando explains. He continued: "Comedy works better under compression. It's better for the room to be smaller than it should be since that alone creates more possibilities for fun. It is harder to fill a massive stage, whereas it is easier to play if the doors are closer to one another. The compressed atmosphere also makes sure they are constantly bumping into each other." And how many entrances and exits are there? "About 300," says John, "But it feels more like 900," retorts Mark. "The goal is to have things happen instantaneously," Mark continues, "and the more compact the space is without stretching, the easier it is to pop in and pop out. We have to factor in even the amount of time it takes to turn a door handle. " Can it be like watching a tennis match? "Yes, with twelve people playing at once," Mark answers. The discussion turned to whether Feydeau needed updating. We imagined what it would be like if Feydeau was alive today and could bring things like Cialis and Viagra into the script. "It's all there anyway," comments Mark, "even without having those specific things. The staid and stuffy middle class always retained some sort of staid-iness, so that they simply can not truly escape their regular lives. So they go to this hotel to escape, and the world explodes around them, yet they try to maintain their dignity." As we talked, the conversation sped up to the speed of an onstage exchange. Is there a revolving bed? And the plot? John volunteers: "This play, Flea, is about a pair of suspenders that are lost, and then found, arriving in the mail. The play unfolds from this one item, this one thing, and writers of that time were very taken with that sort of thing - creating a story from a simple beginning." Mark: "There was also an interesting sociological and intellectual leap that was happening at this time, Shaw's plays were bursting onto the stage, filled with meticulous stage direction, filled with sharp social satire that was often screamingly funny. " John: "Feydeau was not considered a realist, but you know, he was writing about the very people who came to the theatre, many of his characters were recognizable to the audiences." John: "Three acts, the first two about 35 minutes each and the last about 30 minutes with two intermissions. " Mark: "That's the classical way to do it." Two intermissions are rare these days. But the break is a great help to the actors, too. John: "It keeps everyone going." Mark: "The first break refreshes everyone, and the second is a quick breath before the mad dash to the finish." Some history. Over the years, there have been a number of translations of the original "A Flea in Her Ear." David Ive's new adaptation of "A Flea in Her Ear" was commissioned by Chicago Shakespeare Theatre. It was presented Mar. 10, 2006, its world premiere. If you have seen Flea before, it is likely you enjoyed the original John Mortimer translation which was done for Britain's National Theatre and opened at the Old Vic in 1966. He also did a screen version for a 20th Century Fox film with Rex Harrison. The Barnett Shaw translation ran at New York's ANTA Playouse in 1969. The adaptation by Jean-Marie Besset and Mark O'Donnell was mounted at the Roundabout in New York in 1998, staged by Bill Irwin. The design team for A Flea in Her Ear includes set design by Alexander Dodge, costume design by Gregory Gale, lighting design by Rui Rita, and original music and sound design by John Gromada, Stephen Gabis is dialect coach and Rick Sordelet is fight director. The production stage manager is Donald Fried. A Flea in Her Ear will play the Main Stage from Wednesday, July 30 through Sunday, August 10. Tickets for A Flea in Her Ear can be purchased online or by calling 413-597-3400.